This is the device which is great for writers. Have you ever tried or used it? 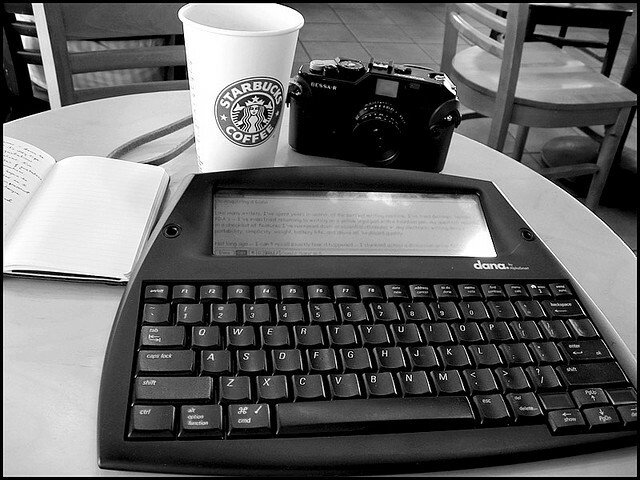 Even when I hadn’t started blogging, I used to search for a device using which I could write or type anywhere I was. I was used to make notes on small, pocket sized folded paper and keep in my pockets. But, managing these was very troublesome and sometimes I used to misplace these papers when I got home. I used to make notes of anything interesting, any ideas I got, any solutions to problems – technical or non-technical, and more such things. This was nearly 10 years ago. Before this time, I had seen a Palm device with a friend and thought of getting one because I loved to use the stylus to write on it. But after seeing how much slow it was, to recognize handwriting, and how we had to write in a specific stroke for it to understand the alphabet, I forgot the idea. But, still I had a wish inside, to get a small/portable device I could use to jot down anything and anytime. There were also the old Casio (hand-held) organizers which I also liked, but don’t know why I didn’t get. A few friends had these and I liked them. I think some even had an option to sync with the computer. This was even before the above time of the Palm PDAs, I think the time was around 1997. Then, came mobile phones, but since I hadn’t bought any, nor did I want to use any which my employers tried to give me, I wasn’t familiar or had even heard much about “office mobiles”. I wanted a device on which I could type or jot easily and which could sync and backup my notes and other such stuff to a computer. I used to look for such devices at times but didn’t get much information at the time. Then, I got my first mobile phone (a Samsung Guru series) but it didn’t have any program or app using which I could type any notes. The only way I could save a note was to write an SMS and save it as a draft or send it to myself. And, typing was tedious, as you know it is, on a simple mobile phone. Then, I got a Nokia 5130 Xpress Music mobile phone, about which you already read on the above link. Using it, I sometimes saved notes but the notes length was very limited and I am used to writing in detail. I wanted something that could save longer notes. Anyway, I lost this mobile as you know from the above link. I got a used Nokia smartphone (more on this in another post) and that’s what I still use to type many of these blog posts. 🙂 But the screen is still very small and I feel like having a larger screen and better keyboard. At least locally, no bluetooth keyboards are available and if I order one, the price is higher than what I paid for this used smartphone! And still, there’s no warranty on those bluetooth keyboards. Recently, I also got a wireless deskset (a keyboard and mouse), thinking that I could just type when away from the laptop (that’s on bed), but the keyboard didn’t work properly even at a few metres distance and typed junk characters. I lost an article I typed this way, so I stopped using the keyboard from a distance. This wasn’t the device that could work for me. Of course I still use it for normal typing. A few days ago, I was again searching with the keywords “a device for writers” and somehow hit upon the Alphasmart Dana and Alphasmart Neo (pictured above). I was amazed seeing and reading about them. I asked myself why didn’t I know about these before, since the Dana was made in 2002. It’s discontinued, as well as the Alphasmart Neo 2, but it’s a great device which can be used to type anywhere you are. It’s still available on their UK website, so some of you from the U.K. might want to check this thing out. The price is a little on the heavy side, but you can get the U.K version at about 120 Euros. Sure, it’s not something you can tuck into your pocket and carry anywhere, but it’s much better than all of the devices I mentioned in the title. I have only read about it but will be trying to get a used one soon. If you write a lot, which I’m sure most of you do daily, and if you like to write when away from your computer/laptop/netbook, you would like this device. Maybe many of you already know about this device and use it too. If that’s the case, I’d love to hear about this device in the comments. Please let me know your experience with the Dana or the Neo, if you have or have used it. This is my 15th day post for the UBC. This is would of been a great device to keep by your bed. Great article. It’s also great on battery backup, can backup the typed notes on to an SD card, connects to the computer via USB, can also be used as an additional keyboard, if the main keyboard stops working for any reason. Well I’ve never used that tool it does seem like it would be handy. I guess I’m of a generation that grew up with computers tho so without my mac book pro and my iPhone I’d be lost. I love jotting notes still but find when their digital and with me (iPhone) their much more relevant and useful. Once you get this product I’d be curious to hear how you like it. The advantage of this device is the battery life, which can go up to an year of typing and the simple but usable screen, just needed for typing our ideas. Phones and even tablets seem to be smaller, and lack the keyboard. Bluetooth keyboards can be used, but are expensive as well as it’s troublesome to carry two things. And this could even take up a beating, the iPads can’t. Talking about digital notes and safety, the latest version of this device = the Neo 2 – has an optional receiver which can connect the device and transfer to a Google Docs account. I’ll be sure to post a detailed review of this device, once I get it. Thanks for stopping by. Raspal havent heard of this device. But for me if not using a laptop I prefer using a note to sketch down my ideas. I usually put down my ideas in a note book that way the ideas don’t get missing.